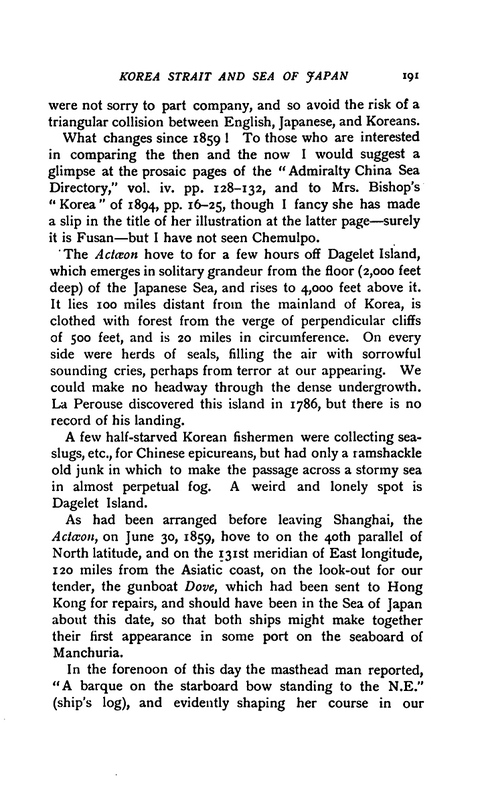 The following page was created to build a clear picture from largely ignored part of the Dokdo-Takeshima dispute. Clear documents from Korea describing the situation of Koreans on Ulleungdo during the 18th and 19th Century exist. 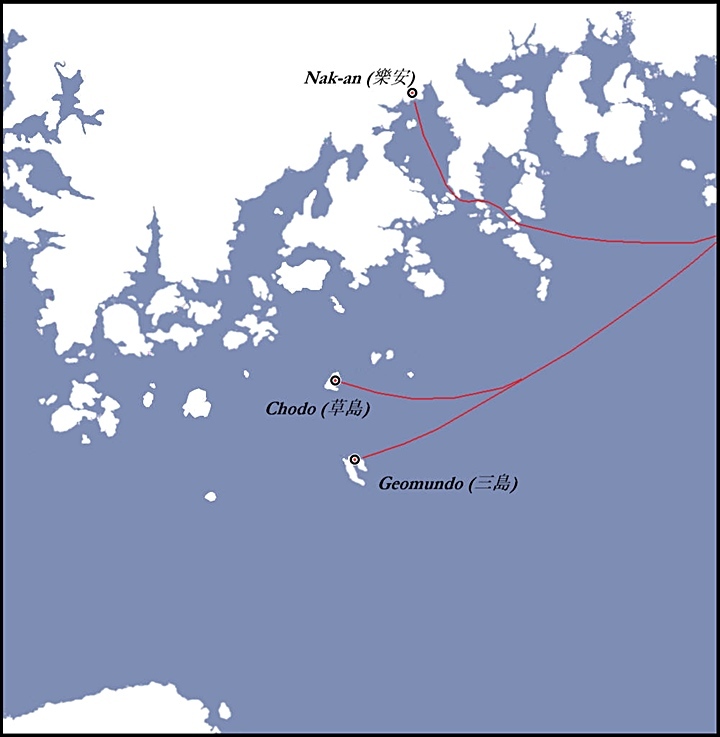 Japanese Takeshima lobbyists insist the Koreans were essentially agriculturalists who lacked the ability to sail and thus could not have voyaged the 87kms to Dokdo. Is this an accurate portayal of the situation? Below are a few historical references from early European explorers and the Koreans themselves. From there we will get a brief look at some images of Korean boats from the late Chosun era. Could Koreans have voyaged to Dokdo and were they cognizant of the island? This page starts with a map of the Korea, Ulleungdo, Dokdo and Oki Islands region. Korea’s historical claim to Ulleungdo goes back to the year 512. 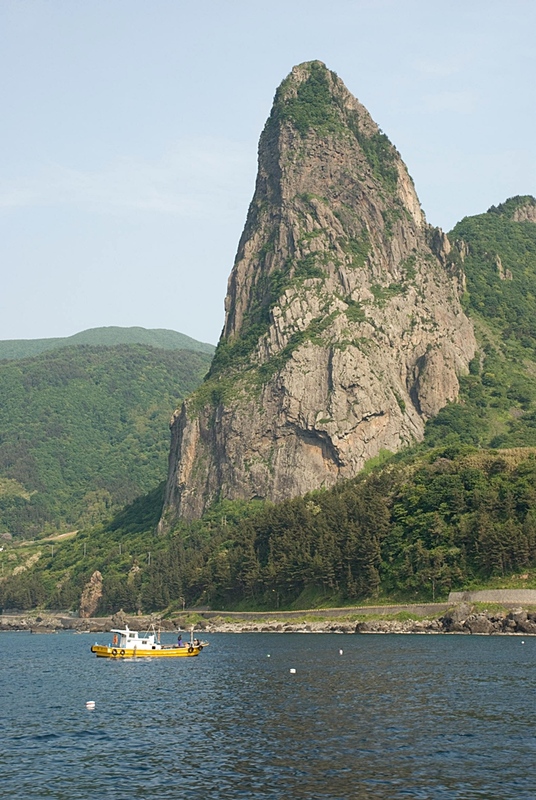 Dokdo Island is about 87kms away is visible from Ulleungdo three times a month on average. 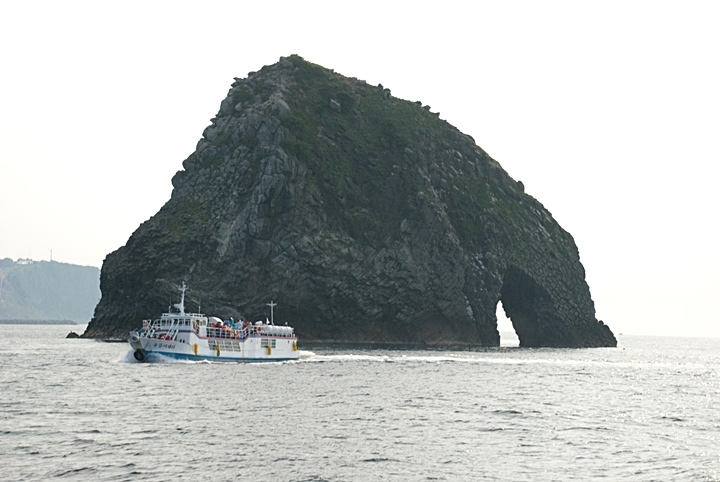 Dokdo Island is called Takeshima by Japan and sometimes referred to as Liancourt Rocks by some western nations. Above left: A overall map of the Ulleungdo, Dokdo region. Koreans have lived within visual proximity of Dokdo since ancient times. Above right: A picture of Dokdo Island from Korea’s Ulleungdo Island. 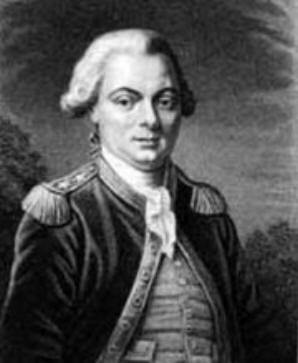 The first European records of Ulleungdo Island were written by French explorer Jean-Francois de Galaup, comte de La Perouse (shown below right). La Perouse was appointed in 1785 to lead an expedition to the Pacific. His ships were the Astrolabe and the Boussole, both 500 tons. They were storeships, reclassified as frigates for the occasion. Here it was first recorded Koreans were voyaging to Ulleungdo and building Chinese style sailboats there in at least two different locations. “…May 27th I gave the signal that we arrived on the East Sea. After a short while, to the North~Northeast an island was observed that was not on any charts. This island seemed to be 20 leagues (actual 137kms) away from the Chosun coast. I tried to approach the island but it was difficult because the island was is the same direction as the winds. Fortunately, during the night the direction of the wind had changed. 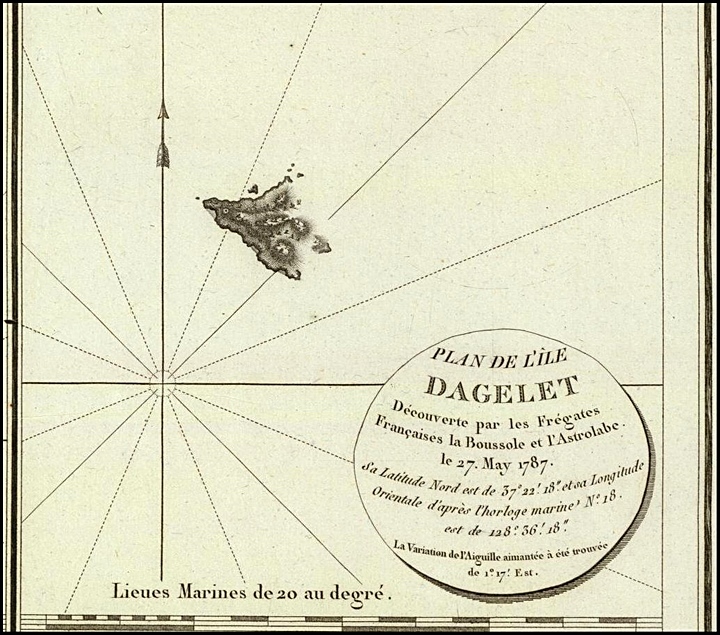 (May 28th) By dawn we left toward the island for measurements and I decided to name this island Dagelet after the astronomer Lapaute Dagelet among our crew who sighted it first. The circumference of the island is only three leagues (actual 33kms) Maintaining a distance of 1.9kms from the island we travelled almost all around but failed to find deep water. 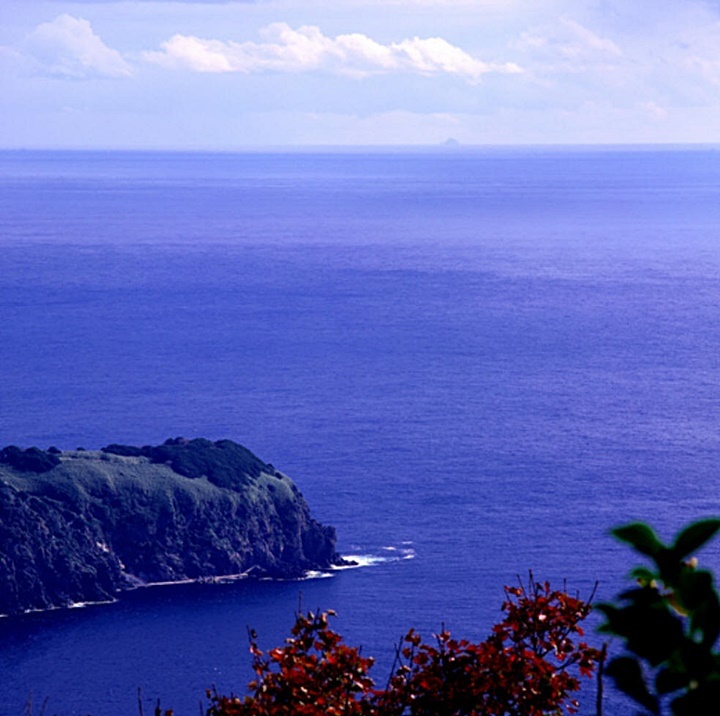 Above left: Ulleungdo Island as La Perouse saw it. The breathtaking view of Ulleundo’s northwest shore from Hyangmok Point looking eastward. Above right: The map of Ulleungdo drawn by La Perouse in 1787. “…The Actaeon hove to for a few hours off Dagelet Island, which emerges in solitary grandeur from the floor (2.000 feet deep) of the Japanese Sea, and rises to 4,000 feet above it. It lies 100 miles distant from the mainland of Korea, is clothed with forest from the verge of perpendicular cliffs of 500 feet, and is 20 miles in circumference. On every side were herds of seals, filling the air with sorrowful sounding cries, perhaps from terror at our appearing. We could make no headway through the dense undergrowth. 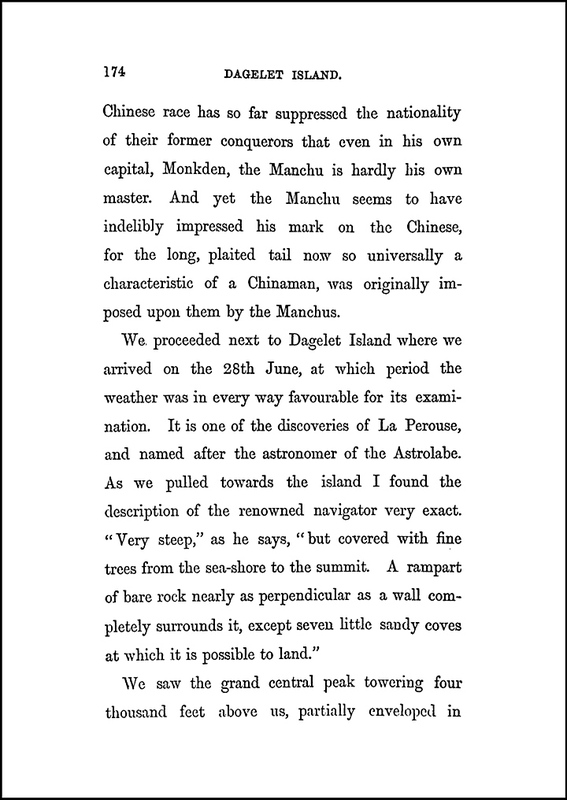 The British Publication “China Pilot” was a guide to navigation around the world and described various sealanes, islands and often gave brief described some areas in minor detail. 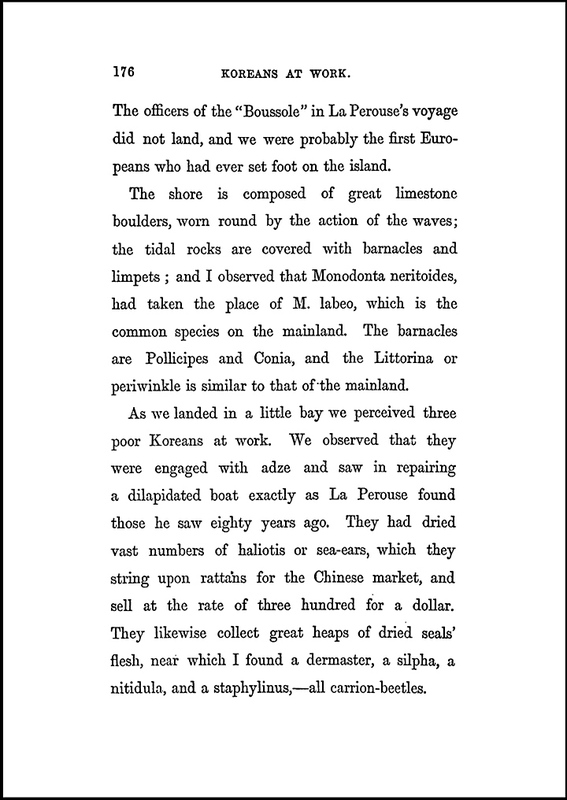 In the 1864 edition it was again recorded Koreans building Chinese style sailboats (junks) on Ulleungdo and collecting shellfish, most likely abalone. Above left: Hole Rock (also called Elephant Rock located off of Ulleungdo’s North Shore. 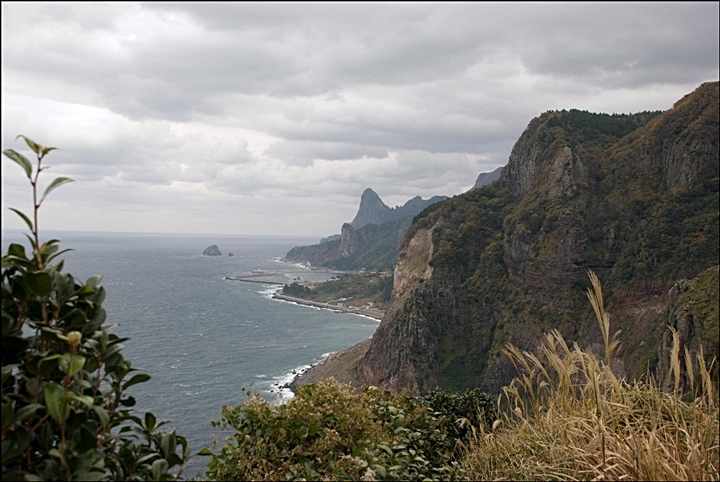 Above right: Song-Got Mountain again on Ulleungdo’s North. As the China Pilot states, most of Ulleungdo’s spectacular rock formations are on the islands North and East sides. 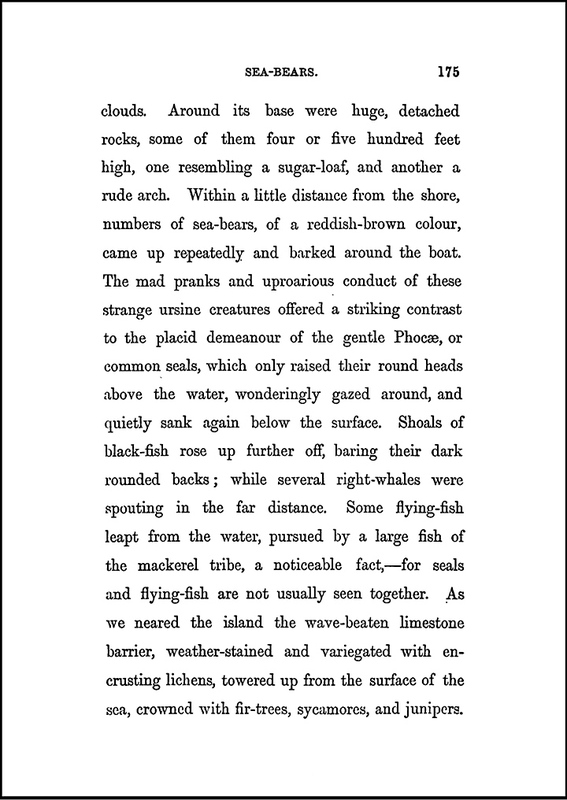 “…There are several detached rocks along its shores, principally, however, on the north and east sides, some reaching an elevation of 400 to 500 feet. They are all, like the island, steep-to, and the lead affords no warning, but none of them are more than a quarter of a mile from the cliffs, except the Boussole rock, the largest, which is 7 cables from the east shore of the island. Hole rock on the north shore is remarkable, from having a large hole, or rather a natural archway through it, while nearly abreast it on the shore is a smooth but very steep sugar-loaf, apparently of bare granite, about 800 feet high. The sides of the island are so steep, that soundings could only be obtained by the Actaeon’s boats, almost at the base of the cliffs, while in the ship at 4 miles to the southward no bottom could be found at 400 fathoms, and 2.25 miles north none at 366 fathoms. Landing may be effected in fine weather, with difficulty, on some small shingly beaches, which occur at intervals, but the greater part of the island is quite inaccessible. Arthur Adams was an English physician and biologist who voyaged throughout Asia. 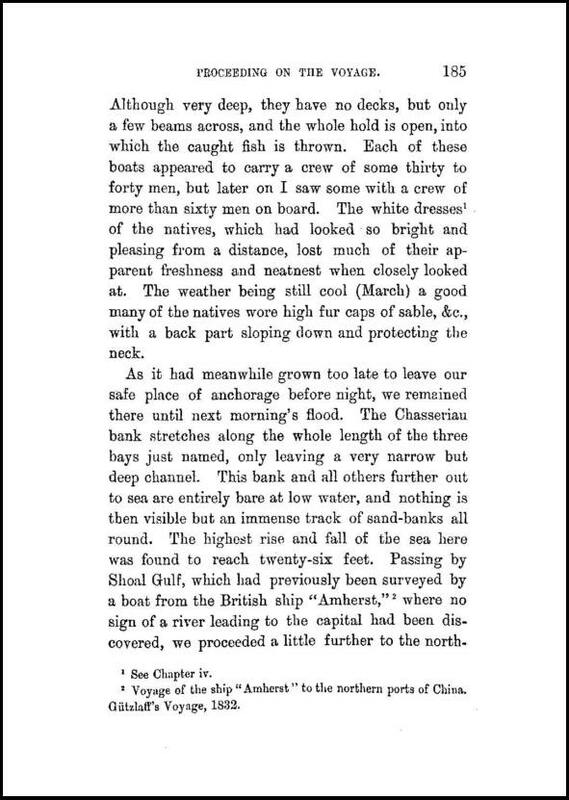 Adams was assistant surgeon on board HMS Samarang during the survey of the Malay Archipelago from 1843 to 1846. 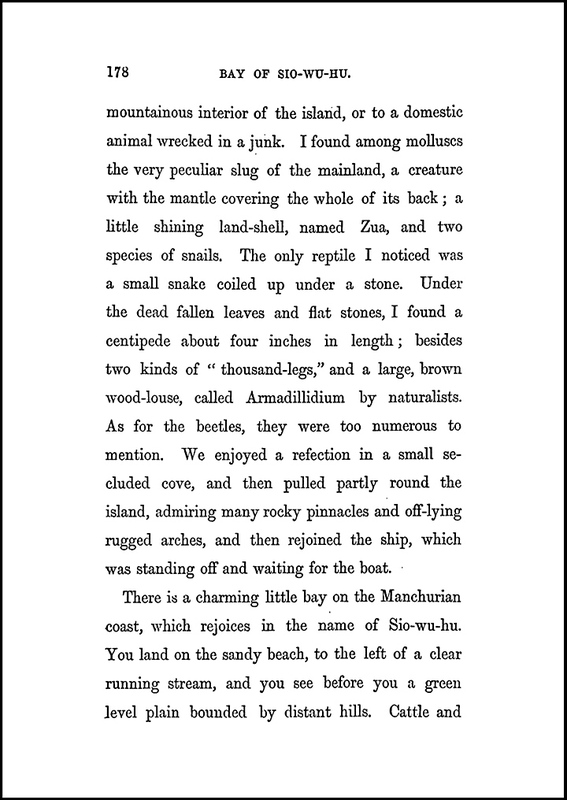 He edited The Zoology of the voyage of H.M.S. Samarang (1850). 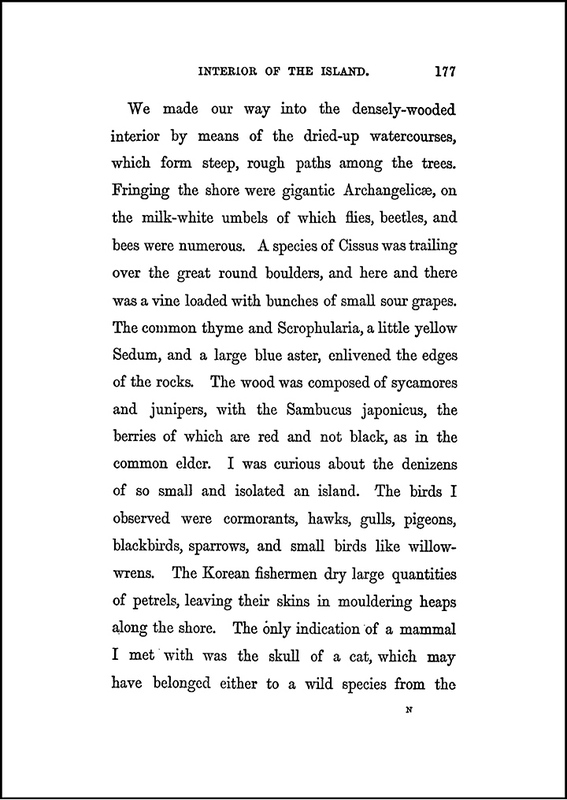 Later he would travel to Korea and Ulleungdo Island (Dagelet) and below is an excerpt taken from his published book Travels of a naturalist in Japan and Manchuria (1870). 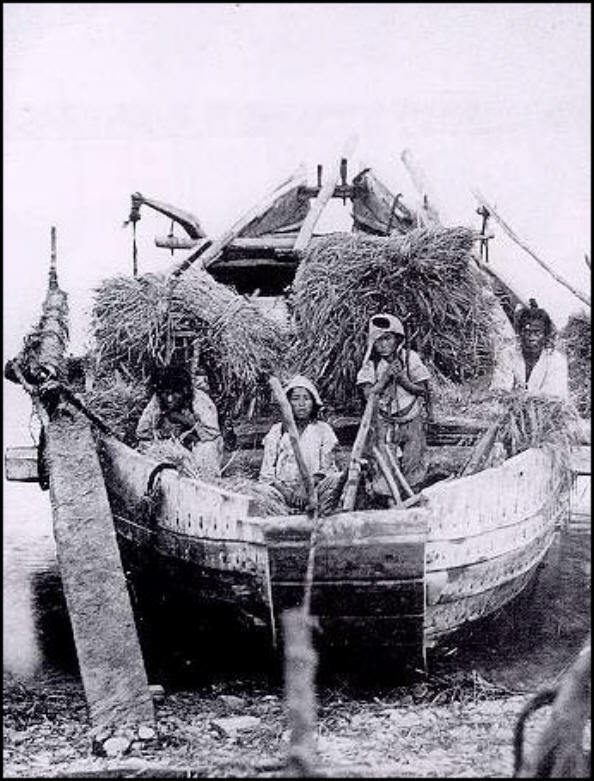 Below he describes the Koreans in repairing a boat, but given the fact they were using specialized carpenters tools (adze), it seems these fishermen were building a boat. In the year 1882 King Gojong of Korea dispatched an inspector to Ulleungdo Island in preparation for settlement of the and to put and end to Japanese traspassing and illegal logging on Ulleungdo. The whole island was surveyed and a census of the residents undertaken. Below are some excerpts from Lee Gyuwon’s diary. It accurately describes the activities of Koreans on the island, most notably those who annually sailed from over 550kms away to build boats, gather abalone and collect seaweed on and around Ulleungdo. The Lee Gyuwon diary belies Japanese Takeshima lobbyists’ inaccurate portrayal of Ulleungdo’s Koreans as dull-witted landlocked farmers. These Koreans especially those who hailed from Chollanamdo (湖南) were islanders, adept at boat-building, fishing and sailing. From this reference combined with that of Lee Gyuwon’s 1882 Ulleungdo inspection it can be concluded Koreans were sailing to and from Korea’s Cholla Province South coast, a distance of around 600 kms annually. The two maps above are of the Korean peninsula. 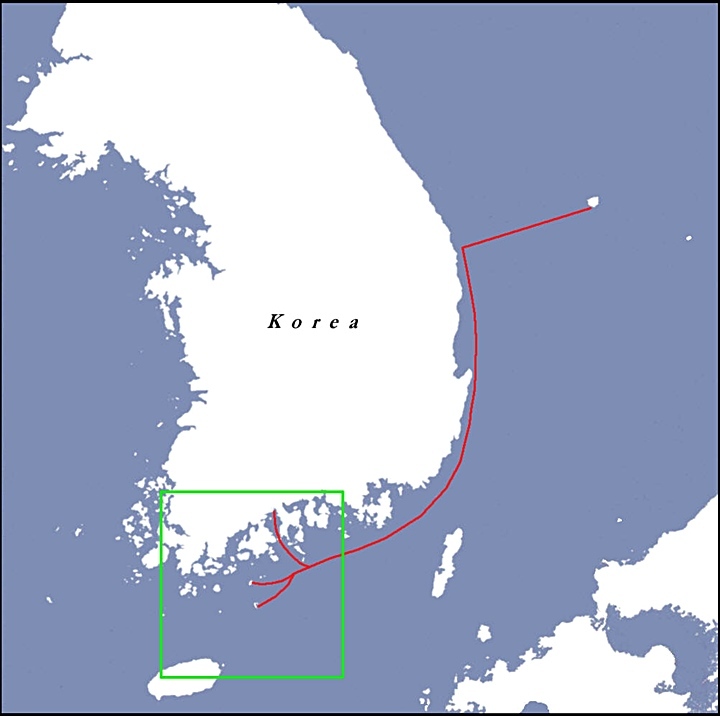 The red line indicates the possible route Chosun boat-builders and fishermen may have taken from South Cholla Province to Dokdo’s neighbour island Ulleungdo. Three regions in particular are mentioned in historical documents Nak-an (樂安), Chodo (草島), and Samdo (三島), which is currently named Geomundo. The images below were some of the first pictures of Korea to be seen by the western world in the late 19th century. It is said the picture on the left was the first photo image ever taken of Korea and as is dated 1871. The picture on the right above is significant. The people in this 1883 photo may have very well been some of the Koreans who sailed annually to Ulleungdo every spring. This photo was taken at Port Hamilton (Geomundo) during the British occupation of the island. At this time Geomundo was a naval base to offset Russian advances in Korea. We can see how poor these people were and why not many records other than Lee Gyuwon’s report exist. Below this text are some classic examples of Korean boats of the Chosun era. 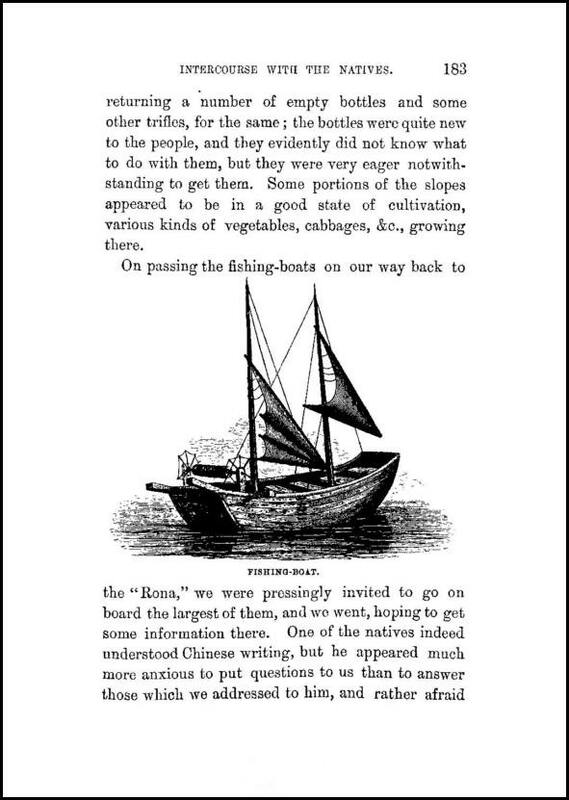 Notice how they resemble Chinese junks as described by La Perouse, the China Sea Directory and the images below in Opperts ‘A Voyage to a Forbidden Land’ written in 1880. These vessels were said to carry 30~40 people but could hold up to 60 if need be. Although described as crude in design, they did manage to sail over 500kms in very seas and then return each fall. 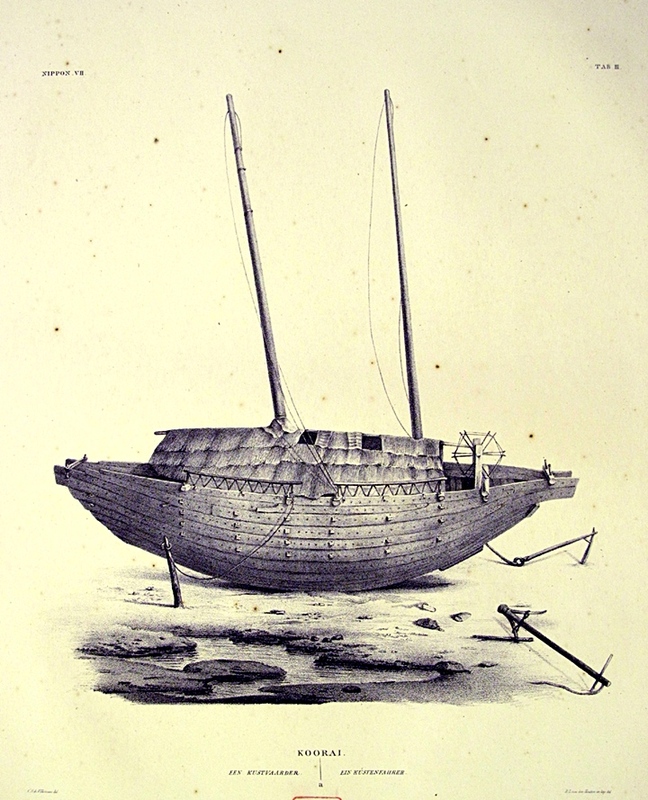 Above left: An artists rendering of a Korean fishing boat from the historical records of Philipp Franz Balthasar von Siebold. 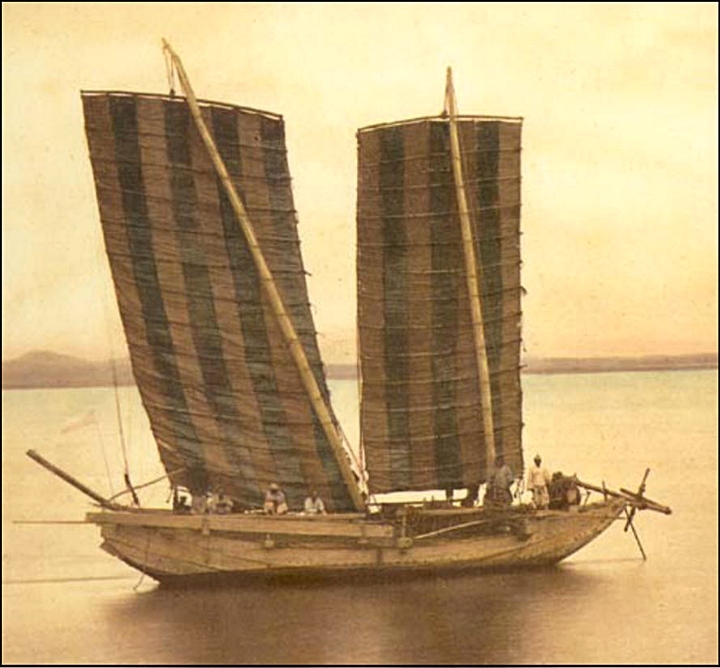 Note bamboo was used for the masts and thatched roof. It was said no nails were used to assemble Korean fishing boats. 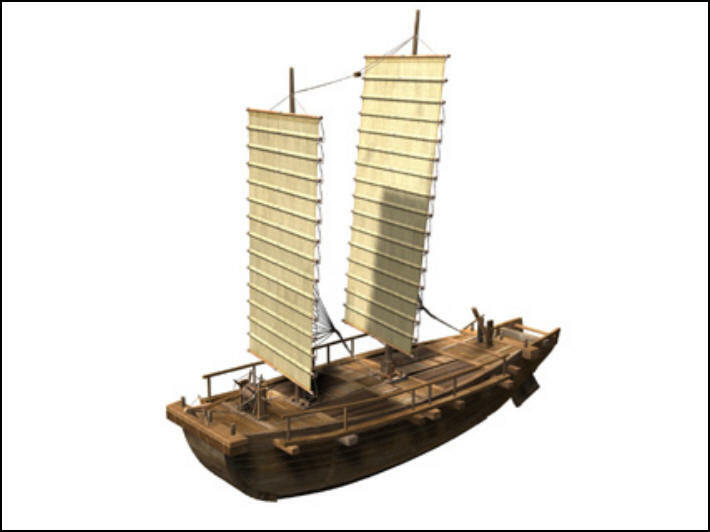 Above right: A computer simulated image of a typical Chosun era boat. At first the passage states the Korean boats were not very high quality. However, they could hold a very large amount of either cargo or crew. Being assembled without the use of nails tells us Korean boatbuilders must have been skilled carpenters. Chosun Life On Ulleungdo During 18th~19th Centuries. Who Were the Koreans Living on Ulleungdo? It has been recorded that Koreans lived on Ulleungdo Island since the 6th Century in ancient documents. The historical references above paint a picture of at least some if not the majority of Koreans who lived on Ulleungdo. The British surveyed Ulleungdo (Matsushima) in 1864 and again reported Koreans were building “junks” or Chinese fashioned sailboats on Ulleungdo and sailing them to the mainland. This report goes a step further and records Koreans gathering abalone showing these people were fishermen as well. Arthur Adam’s diary states Koreans were also gathering abalone and seal hunting on Ulleungdo. 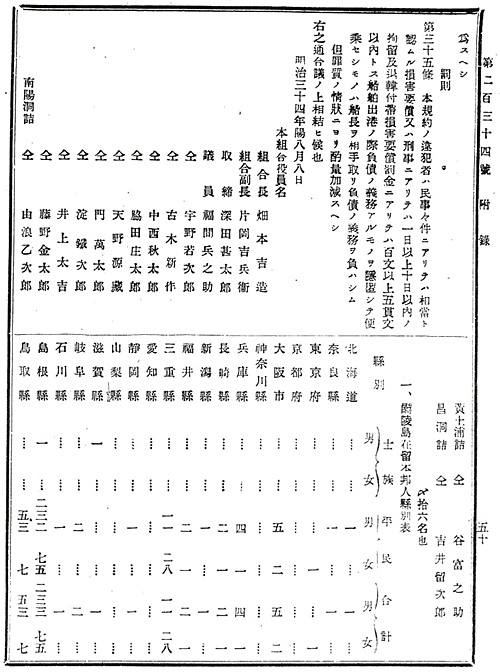 Lee Gyuwon survey and report submitted to King Gojong in 1882 describes Koreans building boats all over Ulleungdo Island. In fact there were almost 100 hundred men involved in this activity. Lee Gyuwon summarized the Koreans were involved in boat-building, seaweed gathering and fishing for abalone on Ulleungdo Island. Any one of these documents on its own aren’t much but when put together we can build a profile of Koreans on Ulleungdo. Much of these people were by and large transient islanders who voyaged 550kms annually. They came from Chodo Island, Geomundo (Samdo) and Nakan in South Cholla Province. Because they were not permanent residents we know they would have relied on Ulleungdo’s marine resources to supplement their diets. They were subsistence fishermen and would have sailed the waters around Ulleungdo. With Koreans sailing around Ulleungdo gathering marine resources, sealing and boat building annually since at least the late 18th Century, the only logical conclusion would be they must have been cognizant of Dokdo. The winds of the East Sea predominantly blow from the West. Dokdo is visible from about 30kms at sea level which is just a few hours sailing. In addition we know Dokdo is visible from the Ulleungdo Island’s peaks as well. 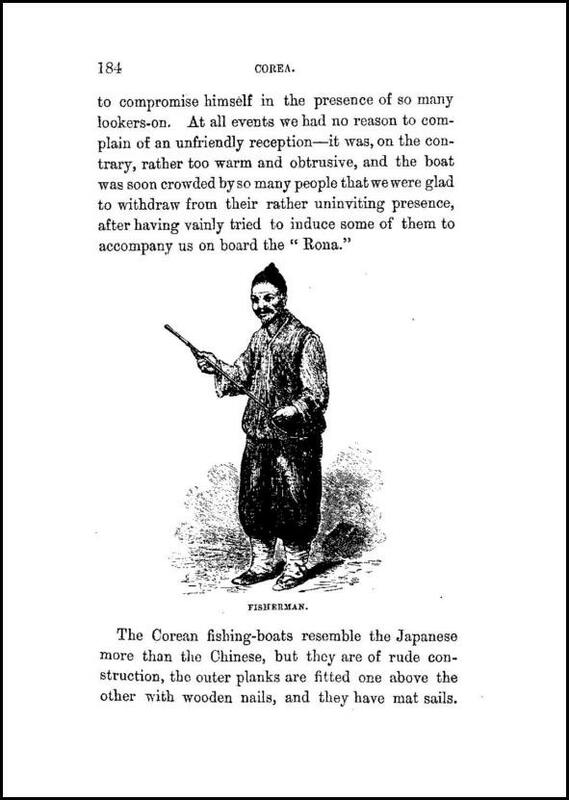 The Japanese “historians” who lobby for Takeshima to be returned to Shimane Prefecture have tried to portray Chosun era Koreans as incompetent sailors and land locked farmers. This is wrong. Koreans of the Chosun era could and did voyage to Ulleungdo Island annually. Chosun era Korea was by and large not a nation of seafaring people. However, there was a a group of Koreans who came from the South end of the peninsula who continually braved the open sea and harvested the marine resources around Ulleungdo in much the same manner as the Japanese.